Animal welfare charity Blue Cross uses digitalsignage.NET to promote Blue Cow, their milkshake business and create the bridge between the two entities. 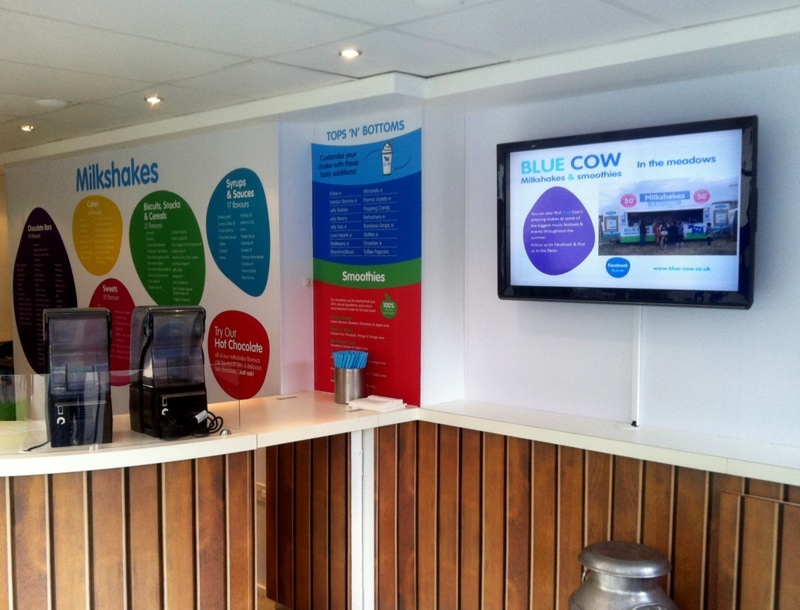 The digital signage system is used to advertise the products in the new Blue Cow store from Stratford- upon- Avon, UK and to inform customers about the business’s charitable purpose. Established in 1897, Blue Cross is dedicated to helping abandoned, ill or injured pets by treating, rehoming and training them as well as by offering pet care information and advice to the public. The company has around 28 rehoming centres across England and Scotland and a mobile clinic in London. Blue Cow was set up as a new mean to generate money for the charity and as soon as their first shop was opened, they’ve started looking at alternative ways to drive sales and educate customers about Blue Cow’s special mission. Besides participating at festivals throughout the summer and launching a mobile unit travel, the company sought to optimise its shop. Blue Cross uses digitalsignage.NET to advertise their Blue Cow mobile units, products (Shakespeare shakes, Hot chocolates & Smoothies) and share information about how and where the money raised is being used. ”We’ve chosen digitalsignage.NET because it is a highly effective and easily accessible product” said Moore. The content is created by Blue Cross with the input of shop managers and it is refreshed bi-monthly via digitalsignage.NET with news and other communications that they want to share with their customers. Blue Cross is already enjoying a tremendous social media success. With over 9, 000 followers on Twitter and over 26,000 fans on Facebook, they understand the potential of social media to get the word out. So the company was quick to use its digital signage solution to advertise the business’s social media accounts on the screen and prompt customers to ‘Follow’ or ‘Like’ the new brand while queuing. Plans for the future? 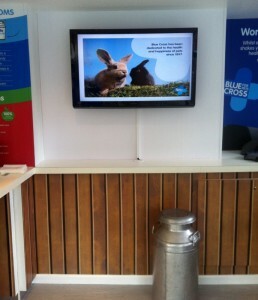 Blue Cross has decided to use digitalsignage.NET for the other Blue Cow shops that are to be opened in the future. This entry was posted in and tagged digital signage, digital signage for charities, digital signage software by Dynamax. Bookmark the permalink.